If you want to know email id of your facebook friends which is hidden and not showing in your friends facebook profile so here is the trick through which you can get email addresses of your all facebook friends . 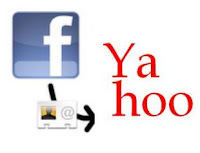 If your facebook account is not connected with Yahoo id then first Create an email id in yahoo and connect your facebook account with yahoo Email Id . Now Login to Yahoo Mail and then go to the Contacts Tab. Thats it ! Click on View imported contacts and See you facebook friends Email Ids .